The City of Grand Island is installing solar panels in a 10-acre plot of land on the edge of town. This is a pilot project as solar energy is becoming a popular source of renewable energy. 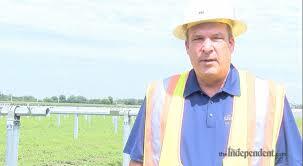 Utilities director, Tim Luchsinger gives some insight on the project. Click image to view the video. This entry was posted in Community-Scale Solar and tagged Carissa Soukup, Grand Island's pilot solar project, Grand Island's Utility Director Tim Luchsinger, Julie Blum, The City of Grand Island, The Grand Island Independent on July 26, 2018 by Helen Deffenbacher. The competition includes four days of inspection, three days of racing on the track, then off to Omaha to begin the road race to Oregon. The public is encouraged to watch the Formula Sun Grand Prix at Motorsports Park Hastings on July 10 from 10 a.m. to 6 p.m. and 9 a.m. to 5 p.m. on July 11-12. 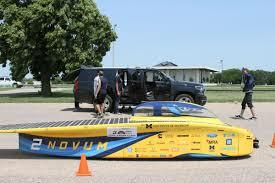 The cars will be on display in Grand Island at the Stuhr Museum on July 14, from 11 a.m. to 3 p.m. More information including schedules, teams and event tracking can be found at americansolarchallenge.org. HASTINGS — The vehicles parked at Motorsport Park Hastings aren’t your typical race cars. Some look more like small flying saucers on wheels with their sleek, aerodynamic designs. 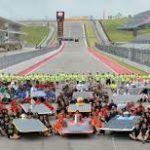 Actually, they are solar-powered cars that are featured in the 2018 American Solar Challenge. Collegiate teams from around the globe brought their vehicles to Hastings Friday in hopes that their creations will be good enough to take part in the cross-country race. Before teams can take off for a 1,700-mile journey that will start in Omaha and finish in Bend, Ore., the vehicles have to go through a process called scrutineering where each car is evaluated for safety and other functions. Hosting both the scrutineering and Formula Sun Grand Prix portions of the event will be Motorsport Park Hastings in Hastings, Nebraska. 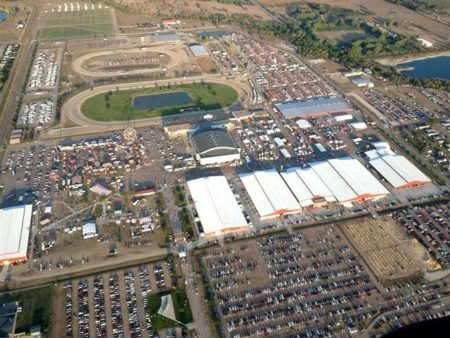 The 2018 Formula Sun Grand Prix will be the first at the 2.15 mile track. 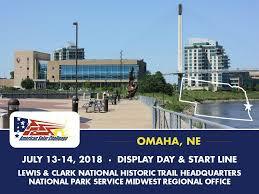 Following the track race, teams will move to the starting point of the American Solar Challenge in Omaha, Nebraska at Lewis & Clark Landing. This is where the display day and multi-occupant judging will take place. 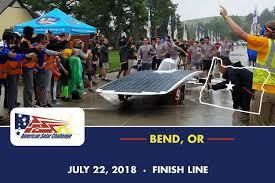 Nebraskans for Solar will be among organizations hosting booths at the American Solar Challenge Display Day at Lewis & Clark Landing on July 13. Please join us for a solar activity for all ages as you visit representatives from local nonprofits. For the road portion of the event, teams can expect a journey covering more than 1,700 miles. The route will cover portions of the Oregon Trail from Nebraska to Oregon. Stops include Grand Island on July 14 and Gering on July 15 – 16. For additional details, see our calendar or visit: americansolarchallenge.org. 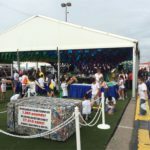 This entry was posted in Nebraska / Midwest News and tagged American Solar Challenge, Nebraskans for Solar NewsBlog, NTV, The Grand Island Independent on July 7, 2018 by Helen Deffenbacher. State tax reform and renewable energy are topics this weekend for the 104th Nebraska Farmers Union State Convention at the Hotel Grand in Grand Island. “Harnessing the Power of Cooperation Since 1913” is the convention’s theme . . . [Nebraska Farmers Union President John] Hansen said wind energy and ethanol are value-added, renewable energy-based opportunities. They use natural resources and agricultural commodities available or grown in Nebraska. The state has more than a $7 billion investment in ethanol and wind energy resources. “It is not the total answer, but it is a big deal,” Hansen said. “It is a tremendous opportunity that stares us in the face in a time of great financial need.” He said the continued economic crisis is driving families off farms and ranches. It is also causing rural communities to lose population. Read more here. This entry was posted in Nebraska / Midwest News and tagged Grand Island, Nebraska Farmers Union, Nebraska Farmers Union President John Hansen, Nebraska Farmers Union's 104th Annual State Convention, The Grand Island Independent on December 6, 2017 by Helen Deffenbacher. The likelihood of a charging station coming to Grand Island increased in March, when the city joined the Nebraska Community Energy Alliance . . . The alliance uses grant funding from the Nebraska Environmental Trust, which receives 44.5 percent of the profits of the Nebraska Lottery. The Nebraska Community Energy Alliance (NCEA) was founded in 2014 as an inter-local cooperative agency. The alliance’s mission is to “build and promote advanced technologies for housing and transportation that save energy,” reduce carbon dioxide pollution and cut costs. One way Grand Island might get a charging station is through Volkswagen’s settlement with the federal government over the car manufacturer’s misleading use of diesel engines. Read the complete story here. 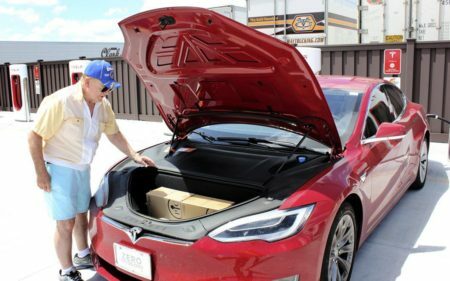 Photo by Jeff Bahr: Eldon Gunderson shows what’s under the hood of his Tesla Model S during a stop Friday at the Tesla charging station near Bosselman Travel Center. He and his wife, Barbara, were traveling from South Dakota to their home in Goodyear, Arizona. This entry was posted in Nebraska / Midwest News, NewsBlog and tagged Electric Vehicles, EV charging stations in Nebraska, Nebraska Community Energy Alliance, Nebraskans for Solar, The Grand Island Independent on July 16, 2017 by Helen Deffenbacher. 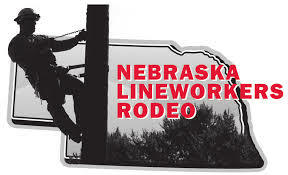 A new 150-by-80-foot indoor riding arena and storage facility will be constructed this spring at Fonner Park behind the cattle barn and south of the existing cattle tie outs, according to Joseph McDermott, executive director of the Nebraska State Fair. McDermott made the announcement during the Nebraska State Fair Board of Directors meeting Friday at the Nebraska Building at Fonner Park . . . Also during the meeting Friday, the board approved a sponsorship agreement with J-Tech Solar of Lincoln and Grand Island to install 88 solar panels on the south end of the Nebraska Building. J-Tech owner Jason Olberding and Drew Coffey, J-Tech head of design and procurement, were at the meeting to discuss the sponsorship with the board. Read more here. This entry was posted in Nebraska / Midwest News, NewsBlog and tagged Nebraska State Fair at Fonner Park, Sustainability Pavilion, The Grand Island Independent on May 13, 2017 by Helen Deffenbacher. AURORA — If it passes regulations, a commercial wind turbine project proposed by Bluestem Energy Solutions and Southern Power District will be the first of its kind in the Aurora area. The installation of four 270-foot turbines near Aurora is pending regulations to be set by the Hamilton County Board of Commissioners. The Hamilton County Joint Planning and Zoning Commission will hold a hearing at 7:30 p.m. Tuesday, May 17, at the Bremer Community Center to develop possible regulations for the proposed and future projects . . . 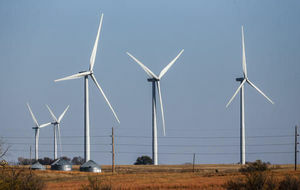 According to the Nebraska Energy Office, Nebraska has 539 operational wind turbines at 18 sites across the state. Read more here. 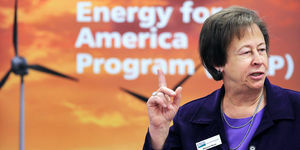 This entry was posted in Nebraska / Midwest News, NewsBlog and tagged Associated Press, Bluestem Energy Solutions, Hamilton County Planning and Zoning Commission, renewable energy development in Nebraska, Southern Power District, The Grand Island Independent on May 15, 2016 by Helen Deffenbacher. CENTRAL CITY – “It is a real honor to be here today to see firsthand how USDA Rural Energy for America Program (REAP) dollars have helped Central City use solar gardens and save on energy use,” Moul said. “The theme for Earth Day 2016 is ‘Our Land. Our Water. Our Future: Let’s Preserve Them.’ This is an excellent example of how our REAP program can help businesses with renewable energy.” Central City’s “solar garden” includes eight 25-kilowatt solar arrays. The entire solar garden will produce 292,000 kilowatt-hours annually — enough energy to power 24 homes or power electric vehicles more than 900,000 miles per year. Read more. Visit www.rd.usda.gov/ne to learn more about programs offered by Rural Development. For Nebraska contact information, visit www.rd.usda.gov/contact-us/state-offices/ne. This entry was posted in Community-Scale Solar, Nebraska / Midwest News, NewsBlog and tagged 2016 Earth Day Celebrations in Nebraska, Central City Solar Garden, community solar development in Nebraska, Nebraska USDA Rural Development Director Maxine Moul, The Grand Island Independent on April 22, 2016 by Helen Deffenbacher.